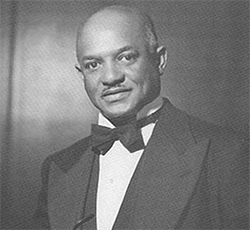 Howard Zebulun Plummer was born on November 16, 1899, in Philadelphia, Pennsylvania. Howard's parents brought him to be blessed by the Prophet. Howard joined the Church of God and Saints of Christ on December 10, 1908, when he was nine years old, being baptized by his father in Chelsea, Massachusetts. On April 20, 1917, during the Passover in Washington, D.C., Howard was ordained a Minister by his father. On August 26, 1917, during the Annual Assembly, his father appointed him General Superintendent of the Sabbath Schools. Bishop H. Z. Plummer had personal contact with President Franklin D. Roosevelt he would visit him occasionally, and wrote some of the prayers used by the President in his speeches. Bishop Plummer led this religious body through difficult times and trying circumstances. In May, 1954, his Imperial Majesty, Haile Selassie, Emperor of Ethiopia, made an official visit to the United States of America. During his stay in Washington, D.C., the Emperor was feted at a reception on May, 27, to which many Black Leaders over the country were invited. Bishop H. Z. Plummer received an invitation and attended the reception. During the festivities, he was personally greeted by the Emperor and engaged by him in conversation. Bishop Plummer later remarked that it was quite an auspicious occasion. The Church of God and Saints of Christ under Bishop H. Z. Plummer experience changes within the doctrine and teachings brought to us by the restorer, however this did not go down well with the church and the new changes was rejected in Jamaica. Bishop Plummer along with his delegation arrived in Jamaica in 1962 with the intention of removing Evangelist at Large Hamilton and replaced Elder Levy as the leader. What happened during his visit was very unpleasant; having tried unsuccessfully to displace the leader from the church he went to the local registry in Spanish Town to administrate changes to the registration but was prevented by from doing so by the Jamaican authority. A meeting was held and Evangelist At Large Hamilton decided not to go along with the new changes. Thus a split in the church in Jamaica. The church continued under the leadership of Evangelist At Large Hamilton as Church of God and Saints of Christ and another under Bishop Plummer as Bethel Church of God and Saints of Christ. Rabbi Howard Z. Plummer fell asleep February 24, 1980, and his funeral was held in the Tabernacle in Belleville, Virginia, February 28, 1980.